A big thank you to Susan who not only went back into a parking lot to get this shot but also came up with that great post title. Here are my thoughts, I shlep from one school to the other getting window decals but all my kids are drop outs. Seriously, University of Pennsylvania, Cornell, Wharton, Mount Sinai Medical and Harvard Law? In one family? And the parents are driving an old beat up woodie station wagon? What is the shot? Then again, you never know. I know a couple of families that bred some super kids with these types of credentials. And hey, you have to give them credit for going to motor vehicles with this request. What ma’am? 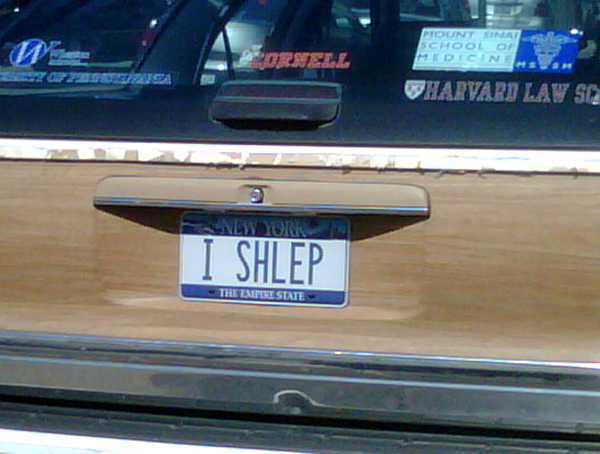 You want a plate that says I Sheep? No, that is shlep. Shlep? What the hell? Yes, and make sure there is a space between the I and the Shlep. This is not my first shlep post, if you have been a long time reader you will remember shop shlep repeat. They are the. Steve Jobses of shleppers. Or maybe they purchased the wagon used…and the selling point was the decals! First of all, it is spelled schlep, with a “c.” And no self-respecting Jew would ever drive a wood-paneled station wagon. This is clearly the case of some goyim trying to be clever. OMG you are the funniest person ever. I think Shiksa Fail would make a great t-shirt. Spelled out in rhinestones, of course. You know, my fingers hesitated when I typed “shlepper.” Thanks for the correction Shiksa Fail. i keep threatening to do a t-shirt line… Z-shirts! this might be a small market but funny nonetheless. no shiksa here! born and raised a heeb for sure, i even have the ugly purple velvet bat mitzvah dress to prove it.